Planning to update your bathroom design? Don't forget to think about the practical aspects of bathroom design as well as the aesthetic elements. When you're giving your bathroom an update, consider installing an eco friendly shower filter from Aquasana. When you install an Aquasana shower filter in your home's bathroom, you'll enjoy a spa-like experience every time you take a shower. Your new Aquasana shower filter will remove chlorine and THM chemicals from the water in which you bathe, providing you with a luxurious showering experience that’s analogous to cleaning yourself in natural spring water every time you shower. As soon as you start showering in filtered water, you'll notice an immediate improvement in the look and feel of your skin. Chlorinated water has a tendency to dry your skin, and one of the first things you'll notice is how much less dry your skin is when you shower in filtered water. chance they will be absorbed into the skin. The heat of the shower opens up your pores, making it much easier for dangerous substances to enter your body. Of course, when you have an Aquasana shower filter, those dangerous substances are removed from the water before you have any possibility of being exposed to them. That's one of the many reasons why bathing in filtered water can have a positive impact on your health. 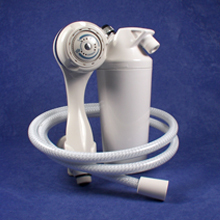 For more information about adding an Aquasana shower filter to your bathroom design, see http://www.aquasana.com/.